Andy Cummings has been in a professional creative role for over 14 years. He has worked for large corporations, such as Alcatel, and a small start-up with airBand. More recently, he started his own company and is doing both print and digital graphic design for a wide range of clients. Here are just a few of the design concepts he has created for PCA: Café Du Luxe, Caulton Contracting, L.A. Guthrie, My Footprints, GWCIA , Relative Jewelry, Joyce Schiska Designs and many others. He also designed the new PCA Web Design & Hosting logo and Web site. Susan has been a graphic designer and illustrator for the past 17 years. She has worked in large corporate environments and small Web shops gaining experience with identity and branding as well as animation and 3D illustration. Since starting a freelance business 12 years ago she has worked with a wide variety of clients. Some projects include: book cover illustrations, website, logo and brochure design, custom signage, and collateral identity for start-up businesses. Susan is passionate about doing anything creative and enjoys watercolor and oil painting as a hobby. Here are some examples of Web site designs she has created for PCA customers: Direct Traffic Control, STS Coatings, Western Accents, and others. Jack Andrews is a seasoned marketing, advertising and creative professional whose experience crosses all platforms and includes most industries. He knows how to combine compelling creative and sound marketing principles to produce powerful, penetrating branding strategies that compete in a dynamic, competitive environment. 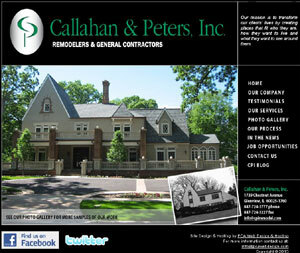 Here are just a few of the design concepts he has created for PCA clients: Gage Homes, Heatbloc, Wolf Law and others. PCA Web Design and its partners will work with your team to use your existing data effectively. Whether you are trying to utilize dynamic content or to create new business tools online, we have the experience to find the best and most cost-effective solution for your organization. Chris Prokop is an accomplished professional with over ten years of online application development experience, beginning with cutting-edge sites from 1994 to the present day. He successfully co-founded, owned and ran a medium-sized online development company for 7 years in the Washington DC area during the height of the internet craze of the late 1990's. He has developed numerous online applications from large to small. After spending several years as a Senior Online Developer building and maintaining real-time financial online applications, Chris has returned to working directly with organizations such as PCA to assist in their technical development and solutions. Advanced Web Systems was founded in 1995 by David Camm. With a degree in Electrical Engineering and professional experience in computing dating back to the mid-1960s, including a 24 year career with IBM, David built a small team of highly talented professionals with skills in business and systems analysis, programming and Internet technology.